I (Chris) recently joined the Eagle Nest Canyon research team after Steve kept urging me to “come visit.” He lured be back to the Lower Pecos because of my research specialty – I study animal bones. Also known as faunal materials, animal bones are common in the dry rockshelters. Zooarchaeologists like me study both the faunal materials and artifacts made from bone. E. J. Reitz and E. S. Wing (1999) define zooarchaeology as the study of animal remains originating from archaeological sites. Zooarchaeology studies those remains from a specifically anthropological perspective, instead of a biological or paleontological perspective. Some archaeologists, Reitz and Wing included, further separate the study of vertebrate bony faunal remains as osteoarchaeology. We would also include other vertebrate faunal remains, such as antlers, teeth, skin, fur, and other soft tissues. Zooarchaeology developed over the past 80 years to investigate the physical constituents of animal bodies, their resulting byproducts, and the remains of any parasites that might have originally been present. Zooarchaeological faunal studies are also used to investigate site formation, biological processes, and cultural processes that are reflected in the particular collection (or sites) being studied. The anthropological perspective addresses the complex interaction between humans, their environment, and the consequences of that relationship. Context of faunal remains is the key to understand their role in any site. Are the faunal remains found in an archaeological deposit there strictly as a result of natural processes? Are the faunal remains spatially associated with other cultural materials? If the faunal remains are spatially associated with cultural materials, then the zooarchaeologist must ask other questions. Have the faunal remains been modified by processes produced by cultural behaviors (skinning, butchering, tool manufacture or use, bone breakage for marrow removal or bone grease production, etc.)? 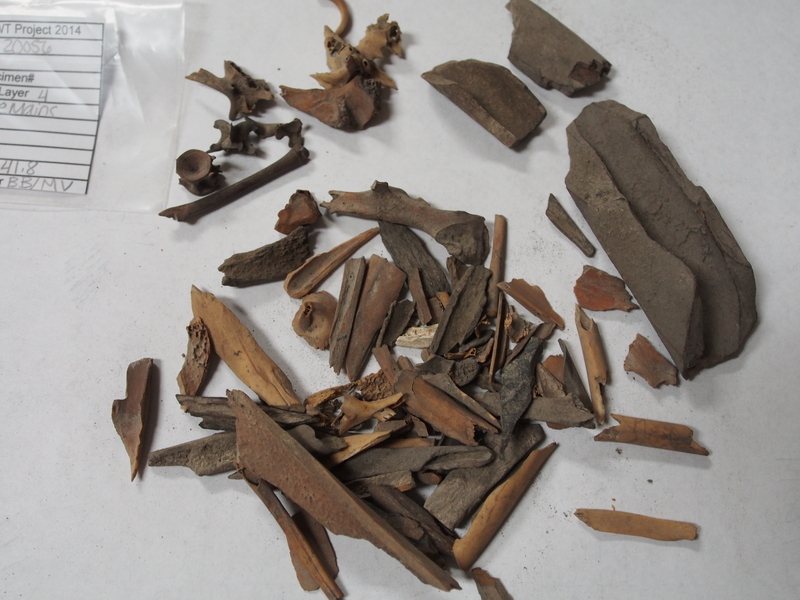 These are the animal bones recovered from one layer of one excavation unit in Skiles Shelter. Much of the bone is from small mammals (e.g., rabbits, squirrels) but the large fragment on the right is probably from a deer. 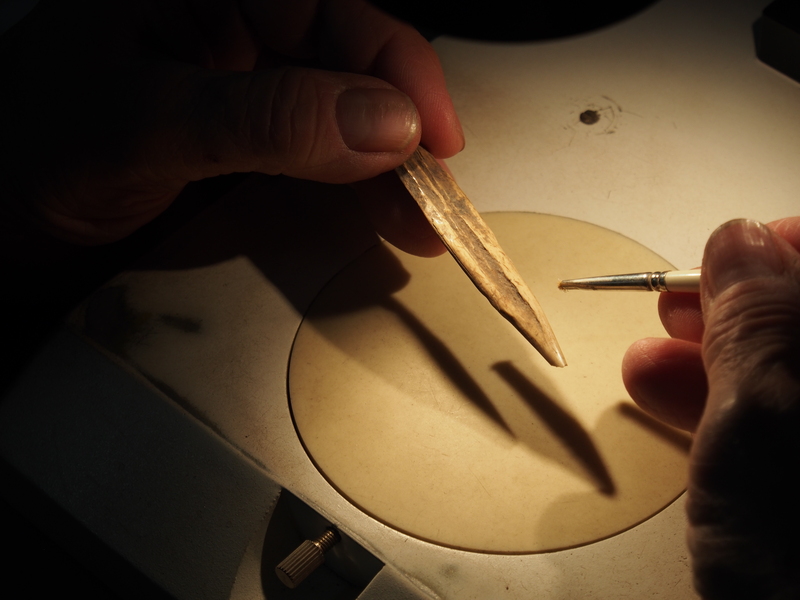 Zooarchaeological studies are important aspects of any archaeological project for several reasons, a prime one being to understand past environments. Animals, particularly small ones like rodents and rabbits, often thrive only in certain ecological conditions, like arid uplands or well-watered canyons. By studying a faunal assemblage, a group of bones from same archaeological context like a rich midden layer dating to the Late Archaic about 3,000 years ago, we can make inferences about the paleo-environmental conditions in the vicinity. Faunal materials can also open windows into how prehistoric cultures functioned. Archaeologists use bones, teeth, and other faunal materials to address questions about subsistence (diet and hunter-gatherer economy) and in the Lower Pecos, later groups often relied heavily on small mammals and fish. And we try to figure out the exact techniques used in making bone tools and ornaments and how these crafted bone items were used. Certain items, like bone rasps used to make rhythmic sounds associated with ritual, may reflect belief systems. Unfortunately, even though the dry rockshelters of the Lower Pecos often yield extremely well preserved animal bones, faunal assemblages have rarely been carefully studied, especially in comparison to the many studies of chipped stone artifacts that have been done. Prior to my work, the only other major faunal study in the region was Kenneth Lord’s 1983 dissertation study of animal bones from Hinds Cave. For my own doctoral dissertation I studied a sample from the nearly 50,000 faunal specimens excavated from Arenosa Shelter (41VV99). This deeply stratified site is on the Pecos River near its confluence with the Rio Grande, about 14 miles southeast of Eagle Nest Canyon and Langtry (see www.texasbeyondhistory.net/arenosa/ to learn more about Arenosa). 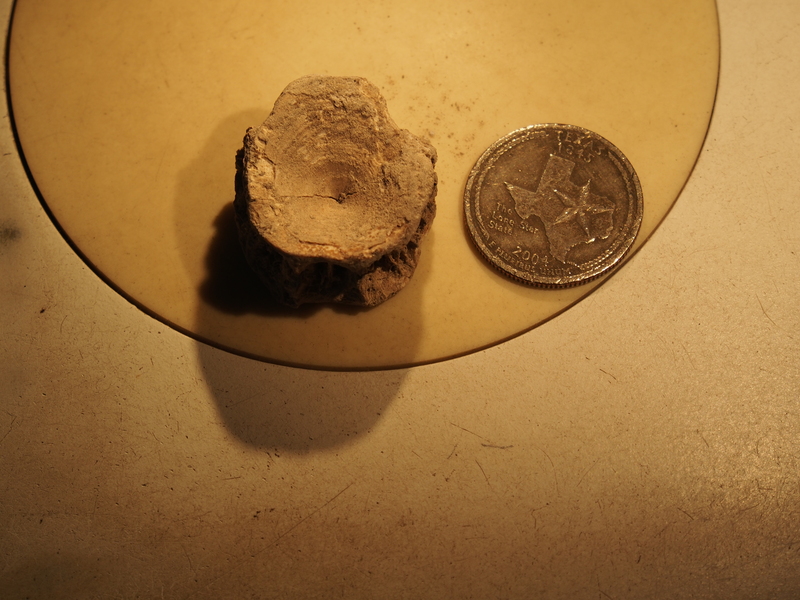 Jurgens identified this catfish vertebrae from Eagle Cave. Based on the size of the bone, this fish would have weighed over 50 pounds! The faunal collections from Eagle Cave, Skiles Shelter, and Kelley Cave can be compared with that from Arenosa Shelter and expand our understanding of life-ways in the western part of the Lower Pecos region. Sixty percent of the Arenosa Shelter faunal materials and bone artifacts were found in upper deposits (strata 4 – 9), a Terminal Late Archaic context dating between about 2,300 and 1,300 years ago. Many of the deeper and earlier Middle and Early Archaic deposits at Arenosa Shelter (strata 12 – 36) were heavily damaged by high energy Pecos River flooding. The floods removed most of the bone these deposits may have originally contained, especially that from smaller animals. Remaining bone in these strata is quite often in secondary context. Although we are still evaluating the contexts of the ENC sites, most of the faunal material we have recovered is well preserved, especially the bones found in organic-rich layers like those seen in the upper part of Kelley and Eagle Caves. 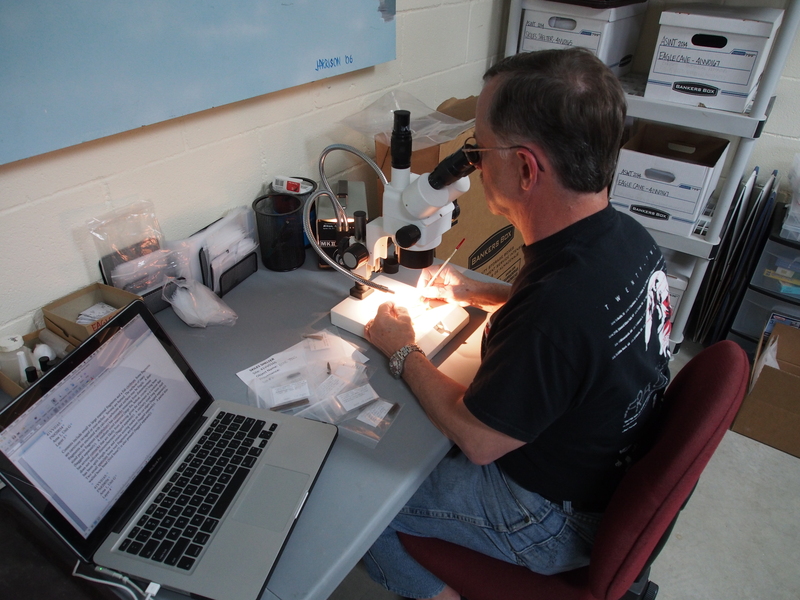 Chris Jurgens analyzes a bone tool recovered from Skiles Shelter. Comparison between Arenosa Shelter and the Eagle Nest Canyon (ENC) sites will primarily focus on Late Archaic and Late Prehistoric bone technology and subsistence economies. The ENC sites appear to contain very similar faunal remains, including those of small to large mammals, fish, birds, turtles, and other reptiles. Much of the faunal material and bone artifacts from the Eagle Nest Canyon sites have not been burned. They will be directly comparable to the Arenosa Shelter observations, including eco-niches targeted by the inhabitants, specific subsistence behaviors that include filleting of fish and specialized skinning of mammalian carnivores, and use wear on tools or ornaments. Who knows, maybe we’ll even find catfish spine tools as at Arenosa Shelter or other, new and unexpected evidence for how the prehistoric inhabitants of Eagle Nest Canyon lived in this austerely beautiful land. 2005 Zooarcheology and Bone Technology from Arenosa Shelter (41VV99), Lower Pecos Region, Texas. Unpublished Ph.D. dissertation, Department of Anthropology, The University of Texas, Austin. 2008 The Fish Fauna from Arenosa Shelter (41VV99), Lower Pecos Region, Texas. Quaternary International185:26-33. 1999 Zooarchaeology. Cambridge Manuals in Archaeology. Cambridge University Press. This entry was posted in Spring ENC 2014 Posts, Zooarchaeology. Bookmark the permalink. Since we’re off this week while we pack for Brazil, we encourage you to take a look at another Texas blog – the Ancient Southwest Texas Project (brought to you by Dr. Steve Black from the Department of Anthropology at Texas State University). I have visited this project (and hope to return before the close of the summer), and continue to be impressed by both the depth of the questions that this group is trying to ask, and the methods that they employ (think 3D plan view and profile maps, etc.). Steve has an incredible talent for bringing some of the best minds in Texas archaeology together in the same place, and he’s at his best on this project. That said, we hope you enjoy the Ancient Southwest Texas Project! Want to contact my friend Chris Jurgens from TWDB days re learning German for research purposes.